Look closely above the door to the shrine of St. Margaret Clitherow in the Shambles and you can see some bits of straw and twigs. There is a feral pigeon nesting in easy reach just above the door, how is that for faith!. This may look as though the fire engine is trying to get past the cyclist. However, the cyclist has just ridden around the stationary fire engine that was responding to an alarm in the Debenhams department store. Coffee Yard runs from Grape Lane and Swinegate corner to Stonegate passing the mediaeval Barley Hall. Grape Lane runs off at right angles to Low Petergate towards Swinegate. There are numerous renovated buildings and shops in this area between Stonegate and Church Street. As you walk along Petergate towards York Minster there is a row of shops in mediaeval buildings including Scotts Butchers (sadly now closed). Note the overhanging upper stories. Tax was payable on the footprint of the building hence the tendency to extend the building dimensions above the ground floor. A few days ago I showed one of the alleys from Ousegate, here is the other one that runs parralell with it and comes out into Peter Lane. St Cuthbert's in Peaseholme Green now used as an admin centre for ST Michael Le Belfrey church has tenuouos links with General Wolfe of Quebec. His parents worshipped in this church whilst they stayed in the Black Swan Inn across the road. The Black Swan is considered as being the likeliest place where General Wolfe was conceived! The development in Hungate has now ground almost to a halt. The credit crunch has meant that the demand for new accomodation has all but dried up. Caught early in the morning before the doors were opened. St Crux is just next to Marks and Spencer on The Pavement next to Whip Ma Whop Ma Gate. The church is used regularly for charity jumble sales and coffee mornings. Snicket, ginnel, alleyway or if you prefer Mark Jone's abbreviated concatenation "Snickelway". This is one of the two from Ousegate that join up with Peter Lane. With the current council dissapproval of the gas lamps on the front of the Guy Fawkes Hotel in Petergate the question of the obtrusiveness of the lamp should be asked ;-)) (for non Yorkies that is a tongue in cheek question). This is one corner of Waterstones bookshop. It used to be the Nessgate branch of the Midland bank (now HSBC). No doubt sold off as the bank did not need two branches within a couple of hundred yards of each other. Tourist signpost on the corner of Nessgate and Spurriergate with a new finger pointing to the recently opened Quilt Museum. The King's Arms is a former 17th century customs house which became a pub in 1783. It was originally known as the King's Arms possibly named after the customs house crest. In the 19th century it had a change of name to the Ouse Bridge Inn. Did they have marketing people back then doing "relaunches"! 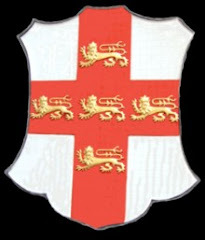 In 1974 the name was changed back to the King's Arms to commemorate Richard III depicted on the present day sign. This change was at a time when he was being sold as not being as bad as he had been portrayed, possibly a case of the victor writing history to suit their own needs. The one remaining link to the intermediate naming of the pub can be seen as you walk up King's Street where the etched windows still have the name Ouse Bridge Inn. The bright colours of the lower section that has been repainted make the Lowther seem less forbidding than the previos black waterproofing of the lower level. I am sure whether it will be practical though, as it will probably need regular repainting after each flooding. View across the River Ouse from Kingstaith towards Woodsmill building. The river is at a normal level. During flood times the bollards can be under water. This rather fine looking building now used as The Gallery night club used to be the Technical College and bears an inscription that it is the Science and Arts Institute. This view of Clifford's Tower is probably not the one you will find in the tourist guide books. This view of the tower is from the end of Castlegate by the Hilton Hotel. Castlegate House stands opposite Fairfax House in Castlegate (another interesting door!) and was designed by architect John Carr. Nowadays it is associated with the freemasons but was at one time the site of The Mount School. Towards Clifford's Tower end of Castlegate is Rustique Restaurant, although the building does not look too interesting in the photo the windows are of coloured glass. I'll have to see if I can get permission to take some photos inside one day to get the light effect through the coloured glass. Just on the edge of Castlegate is this interesting door to Friargate House on the corner of Friargate and Castlegate next to the Friends Meeting Houose. The city of York is well known for the number of Quaker families. This is the Friends Meeting House in Friargate. Castlegate is another of York's streets with a wealth of interesting doors. Her is number 11 Castlegate with a fine stone surround. Alliance and Leicester stands next to Duttons for Buttons in what used to be the White Horse public house in Coppergate, a well known music scene venue in the 1960s. This small unassuming shop in a mediaeval building, holds a treasure trove of buttons in every size, shape and colour that you could imagine. It is also the shop that many film studios turn to for the buttons on their costumes. One of the most famous films they supplied buttons for was "Pirates of The Caribbean"
The access into Marks and Spencer's loading dock is particularly tight and tricky on the corner of the Shambles and Pavement. Traffic very quickly backs up and jams. More seriously as can be seen in the second photo emergency vehicles can get held up. There is an ambulance with flashing lights trying to get past the reversing lorry. The problem has been made worse by the placing of bollards along the length of Pavement thereby preventing the ambulance from mounting the footway to get past the obstruction. I considered calling this one "What an erection!" but had second thoughts about that. From time to time a bouncey castle is erected in Parliament Street or St Sampson's square. I guess ther must be a half term holiday coming up, or is it upon us already!